If you needed any further proof of the impending robot apocalypse, this squirming baby ‘bot should put your remaining doubts to bed once and for all. Built by UK company CNFX Workshop, the bundle of skeletal terror even has a super-creepy name: Nigel Fotherington Cyborg. 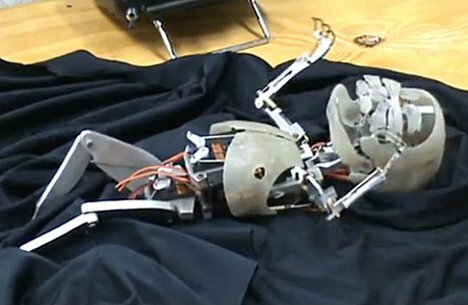 The terribly lifelike movements of the robot baby will eventually bring it to a kind of half-life after it receives its artificial skin. It will allegedly be used for some sort of television show, but we know better. Little Nigel is obviously meant to be the face of the robot revolution. And according to the creators of this terror, the clients it was built for were completely fooled once the creepy thing got its skin: they thought little Nigel was a real, human baby until they were told differently. See more in Robotics or under Technology. January, 2012.